One of the best things about a family holiday is splashing about in the pool. All parents love to see their children happily swimming and becoming acquainted with the warm blue sea for the first time. While it’s rare for anything to go wrong, swimming pools and beaches are not without their hazards. That’s why ABTA have launched a Swim Safe 2016 campaign to make sure families have nothing but poolside fun while on holiday. Follow these tips for swimming safely to ensure you have an accident-free family holiday. Children can be booked into swimming lessons before they hit primary school. But even if your kid does get structured swimming lessons, take them to the local pool so they can have extra practice and get familiar with pools of different sizes. If the resort you’re heading to is home to a water park, the local leisure centre can be a great way to introduce them to flume rides. However, swimming lessons are not just for children. If you’re feeling as though your own swimming skills need topped up, look to see if there’s any adult swimming lessons in your area. Even the strongest swimmer can be caught out at sea if they’re used to swimming in a pool. Let your children paddle at the beach before deciding if they can go further in. Be careful jumping off a boat at sea if you’re only used to swimming in a pool. If wanting to try watersports start off with something simple, such as a pedalo and banana boat before trying jet skis. Before jumping in with excitement, remember to explore the pool area first. Get familiar with the shallow and deep end (and exactly how deep it is) and acknowledge any pool rules. The same applies to the beach. Check to see where the lifeguard is and look around for any flags that you need to stay between. Spot where the rocks are and research beforehand when the tide comes in. Everyone loves an inflatable toy for the pool. However too many can obstruct views and make it difficult for parents and lifeguards to spot any potential emergencies. Take only one inflatable into the pool at a time and if buying for a child, purchase an inflatable that is specifically for kids and won’t block your view of them. Be very careful using inflatables at the beach. While rare, people have been blown out to sea while relaxing on a lilo. Double up with a swimming buddy. 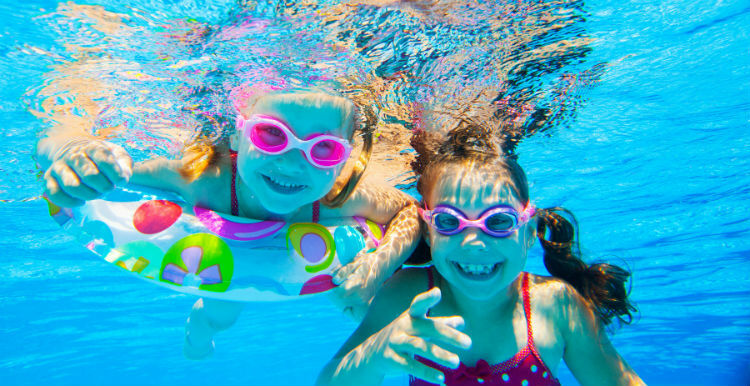 Small kids should always be accompanied in the water and older kids should be told to stay in sight. Even teenagers and adults who are strong swimmers shouldn’t swim too far out to sea by themselves.